On September 11, terrorists flew hijacked airplanes into both towers of the World Trade Center and into the Pentagon. A fourth hijacked plane crashed in Pennsylvania. 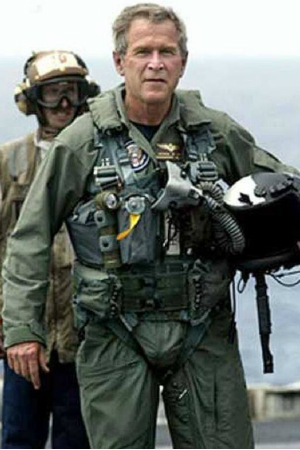 On October 7, Bush announced the beginning of military action in Afghanistan. 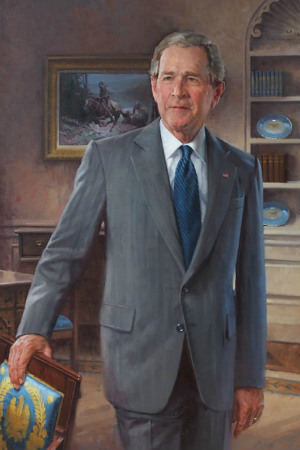 In September, Bush addressed Congress and the UN Security Council to make a case for action against Iraq. Congress authorized force on October 10. On February 1, the Space Shuttle Columbia exploded during re-entry. 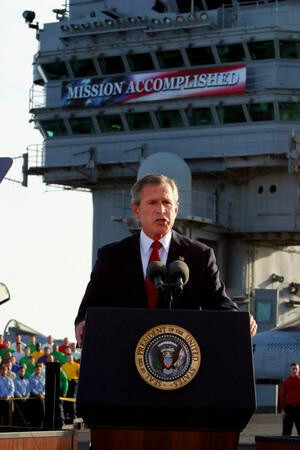 On March 19, the U.S. declared war on Iraq. On August 28, Hurricane Katrina hit the Gulf coast causing devastation to New Orleans and surrounding areas. Scooter Libby, Vice President Cheney's Chief of Staff, convicted of exposing the identity of a covert CIA operative. On September 15, Lehman Brothers investment bank collapsed signaling the start of a global financial crisis. Over the next three months, Bush signed bailout legislation for Fannie Mae, Freddie Mac, General Motors, Chrysler, AIG, and others. Some history of Bush and his stance on major campaign issues. Written by the Associated Press. Photo album of Bush's life from childhood until he ran for president. Located in Midland, Texas this is where the Bush family lived from 1951-1955. Celebrates the lives of two presidents. The Center works for domestic excellence and global leadership. Includes a museum and archives. Bush was one of two managing general partners of the Texas Rangers baseball club from 1989-1994. 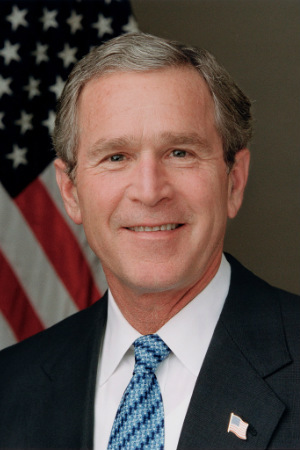 Of the 6 million votes cast in Florida in the 2000 election, Bush won the state's 25 electoral votes by 537 votes. 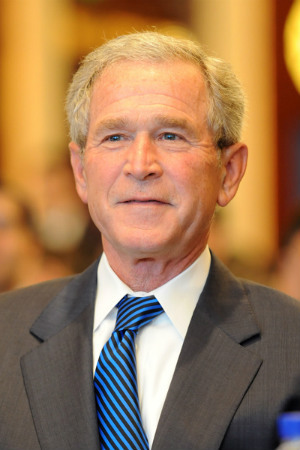 Bush is the only president to have a Master of Business Administration (MBA) degree. Bush's 2002 State of the Union address was the first broadcast live on the Internet. 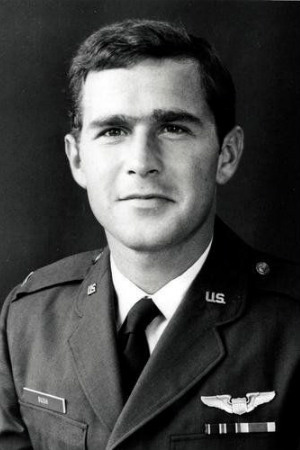 Bush was the first president to serve in the Air National Guard. 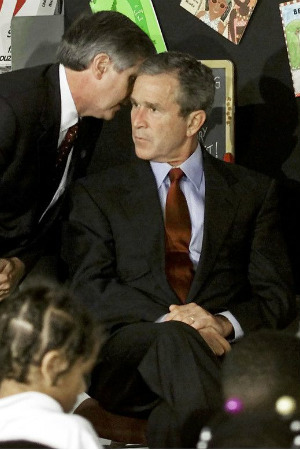 Bush was the first president to attend an Olympic Games in a foreign country. He attended the 2008 Summer Olympics in Beijing. 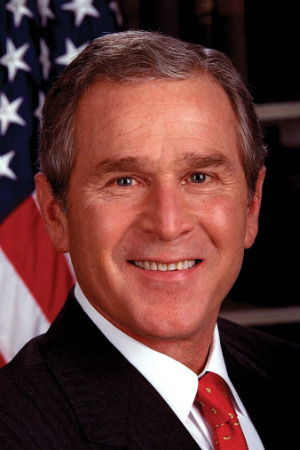 Bush was the first president to leave office while both parents still lived. In 1993, Bush ran the Houston Marathon finishing in 3 hours 44 minutes. He is the only president to have ever completed a marathon at some point in their life.